Imagine a world in which something huge was going on behind the peaceful wax and wane of the little light on your sleeping computer. That time is now. Scientists report that the global crowd-sourced astronomical data crunching project, Einstein@Home, has discovered 24 new pulsars, six of which are members of binary systems. In 1915, Einstein published his theory of General Relativity, predicting that the universe is filled with gravitational waves. When black holes collide or stars explode, these violent disruptions in the fabric of space and time ripple through space as gravitational waves. At the time, gravitational waves were too weak to be detected by astronomical instruments. Today, two detectors, the Laser Interferometer Gravitational Wave Observatory (LIGO) and GEO 600, are coming ever closer to detecting gravitational waves by catching stars and black holes in the process of violent events and directly measuring a gravitational wave passing by. Wielding the most sensitive gravitational wave detectors in history, scientists faced a new problem: big data. LIGO and GEO 600 gather so much data that it would take a single computer, or even hundreds computers, hundreds of years to analyze. Then, the scientists took a leaf from the book of alien hunters. Modeled off of the crowd-sourced Search for Extraterrestrial Intelligence (SETI@Home), Einstein@Home was founded in 2005 as part of the World Year in Physics, and is supported by APS Physics and several international organizations. Download the Einstein@Home app and your computer could contribute to the next astrophysical discovery. Using open-source software on your personal computer, Einstein@Home processes the data when you're not using other programs. The program then sends the processed data back to the LIGO server and receives more to analyze. Of all the computers on earth, this year Einstein@Home was among the top 25 in computing power. What's the use of all this computing power? Researchers say that the crowd-sourced computing allows them to analyze data from astrophysical events in previously inaccessible ways, such as accounting for the role of the Doppler effect in analyzing the puled pulsar signal when the pulsar is rotating in binary motion. 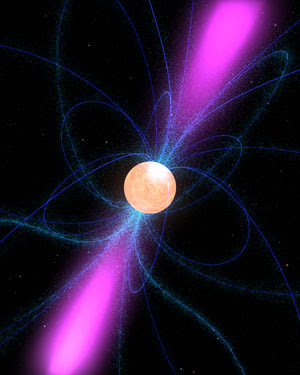 Scientists are interested in spiraling binary pulsar systems because the rotation and merging of pulsars should create large enough deformations to generate gravitational waves detectable on Earth. Using a process that required enough computational power to sort through terabytes of data, the Einstein@Home analysis enabled researchers to observe 24 new pulsars from a study done in the late 1990s using the Parkes 64-meter radio telescope. The telescope captured 3000 35-minute recordings of radio signals from the Milky Way and produced 4 terabytes of data. While about 800 pulsars had been previously found from the Parkes telescope data, these new rotating pulsars pave a new way to seek and measure gravitational waves.